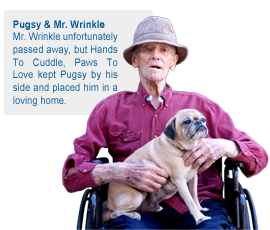 Hands To Cuddle, Paws To Love partners with local community resources to keep pets and loved ones together until the end. Health related issues are a leading cause for individuals becoming unable to care for their pets. We Can Help! To help change the life of someone big and small contact our recruiting office at Recruiting@assisted1.com. Your generosity will be the paw-fect way to be a part of this great program.